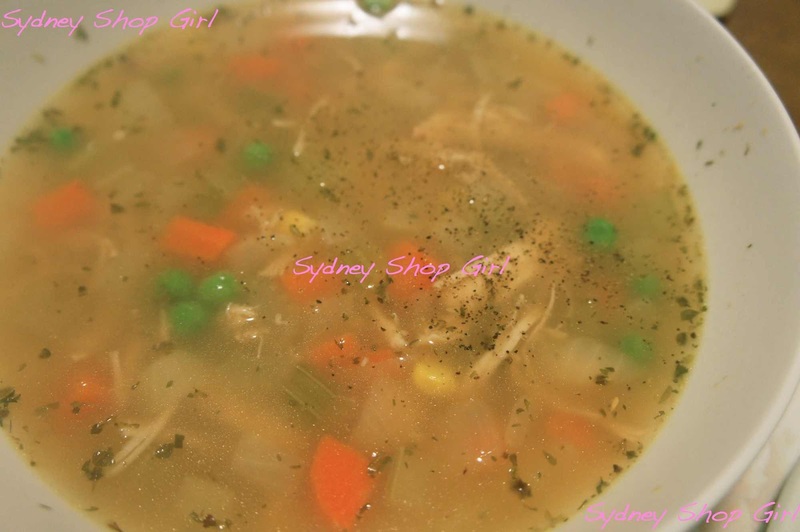 Sydney Shop Girl: Sunrise and Chicken Soup. This weekend, it's been wonderful waking up with the street rather than racing out ahead of it like I usually do. I have a nifty function on my camera that lets me capture the colour of the sky at sunrise. This was my patch of sky yesterday morning. It's all about the colour of the sky, not the composition of the photograph, I'm afraid. 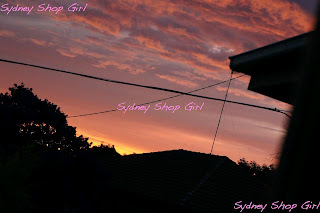 A sky like that takes my mind to the wide open spaces of rural Australia but alas, we're very much in the suburbs with my photo so we have to take the power cables and the roves of my neighbours and I in the photograph and in our stride. As if by magic, those electric oranges and mauves gave way to an impossibly cyan blue sky with a few puffs of cloud by the time I got around to my morning walk. Where could such a beautifully coloured start to the day possibly lead? Readers, you probably know the answer to that already. 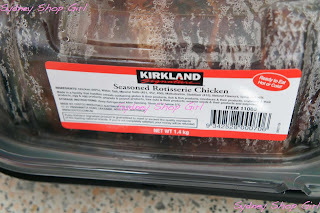 For myself and those still in Sydney but not at the Royal Easter Show, the destination was Costco. For reasons I'm not entirely sure of, Easter Saturday always has the feel of the whole city awakening after a deep sleep. 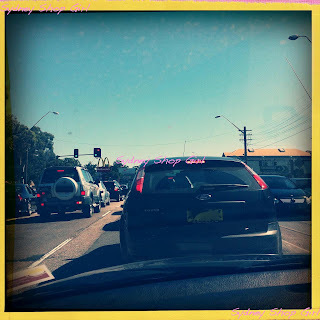 There's traffic everywhere and the shops are packed as people fend of possible starvation from the Good Friday and Easter Sunday store closures. 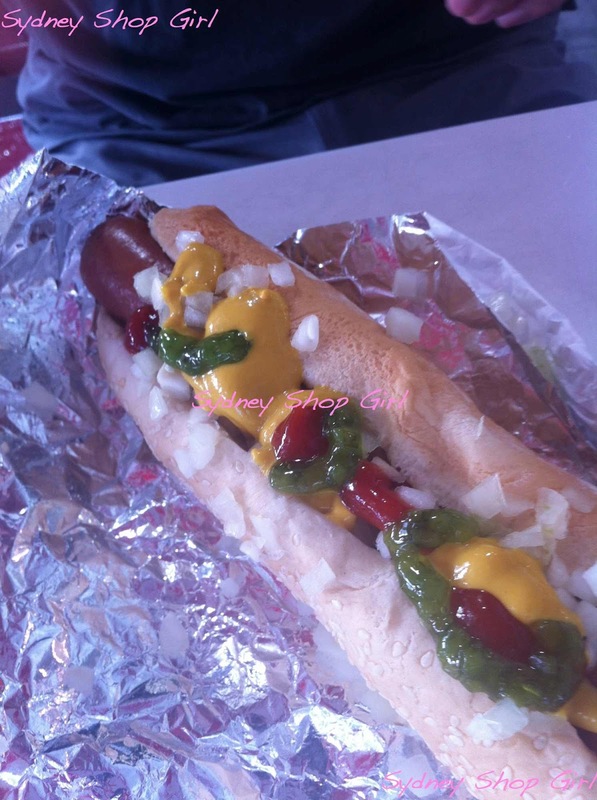 You can tell the hand of Mr SSG was responsible for garnishing this hot dog. If it were mine, the ratio of tomato sauce to everything else would have been reversed. Because the fear of starvation is infectious, Mr SSG and I had super sized breakfasts at Costco while we waited with the crowds for the door to roll open. I have had a life long aversion to hotdogs since surviving the ones of my childhood where the sausages had red skins with the consistency of stretch lycra and the encasing bread rolls were usually sweet and chalky in consistency with waterlogged patches here and there. Happily, Mr SSG's hotdog was none of these things. The sausage didn't burst out of a superhero lycra casing and while the bread was sweet, it wasn't soggy. 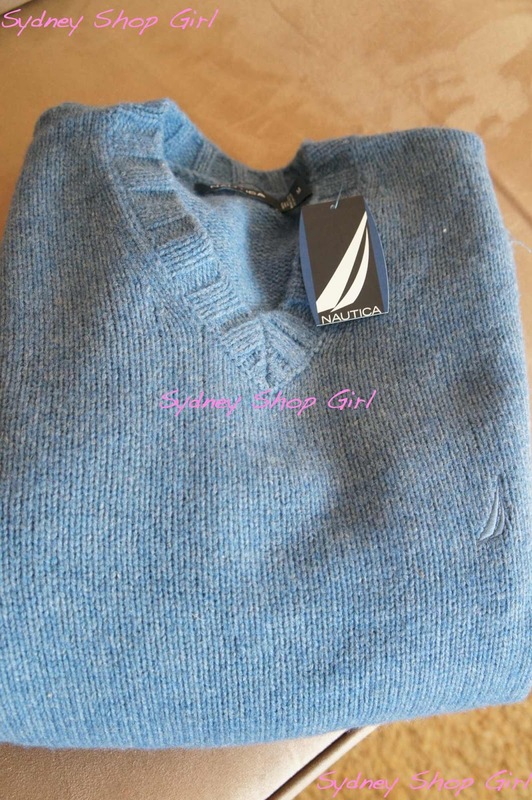 Men's wool blend sweater - $39.99, Nautica at Costco. Mr SSG was on fire in the shopping stakes yesterday. Which means that he walked into Costco needing a specific item of clothing and walked out with it. Singular. Not one in every colour in his size. Just the one wool V-neck sweater for work. I like to think that he'll get so much wear out of it he'll just have to return for a second but I don't thing that's going to happen. Long sleeve wool top - $19.99, Segments at Costco. I was not to be left out and found this Merino wool long sleeved top for $19.99. It's 100% wool and best of all it's 100% wrinkle and crease proof. I know this for a fact because I pulled it out of the bottom of the shopping when we got home and it survived unscathed. They are fairly fitted but not as much as those Kookai ones that have a tendency to run after a few months. Ladies microseude clog - $12.69, Dearfoam at Costco. There is no such thing as too many around the house footwear options. It's not quite ugg season but it's a bit cold at times to be going around barefoot. Which is where these Dearfoams come into things. They are completely synthetic and machine washable. The bottoms are suitable for both indoor and outdoor use and there is actually a fair bit of support and cushioning in the sole as well. This is the seal grey shade but from memory, there was also black and a camel shade available. We have barely been separated since yesterday afternoon. Long time readers of Sydney Shop Girl will be familiar with my love of a rotisserie chicken. And it was only a matter of time before I got my hands on a Costco chicken for one of my numerous 'Extreme Chook Makeover' recipes. They are larger than your standard supermarket chook and cost a little less at $8.99. They are also less salty, very moist and don't come with stuffing. Which makes them ideal for use in a recipe. My plan for the chicken was to make a soup out of it. Using the frame to make a stock and adding the meat back into the soup in the final stages of cooking. 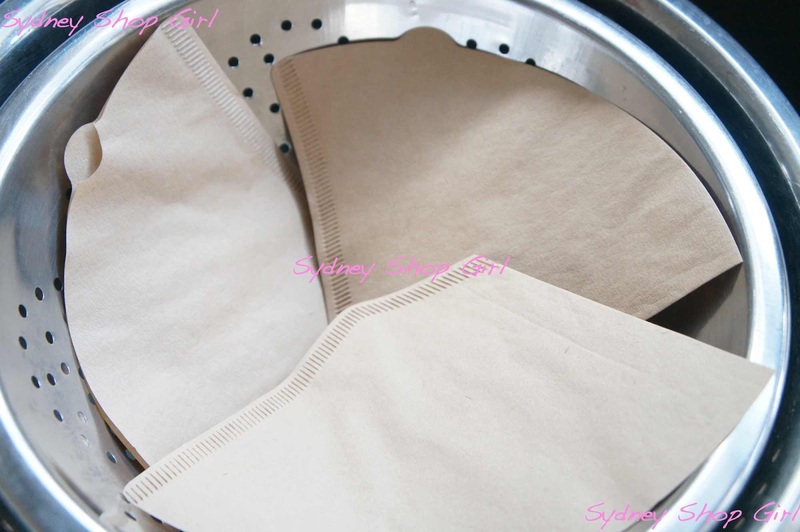 Making stock at home requires straining and this traditionally involves muslin or cheesecloth. Neither of which I had in the house. 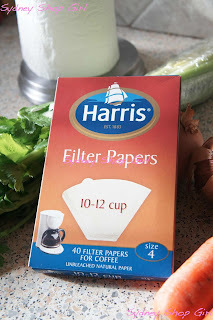 But I did manage to find coffee filter papers at Coles for under $2. Isn't the internet a never-ending source of creative genius? The trick is to use the filter papers to line a colander and then pour your stock over this arranged papers. I thought that layering the filters as they came out of the box would double the filtration and hence drag the process out for longer than necessary. So I cut them down one side and layered them as in the above photograph. It actually worked really well. I went through 2 sets of filters with my stock. 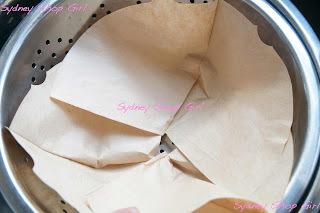 The bonus is that process is tidy using papers because everything can be discarded when you're done and there aren't any cloths that need to be washed and dried. The stock consisted of 2 litres of chicken stock, a litre of water and the bones and skin from the chicken. I added celery, a bay leaf, an onion and some black pepper as well. Boil the lot for 30 - 35 minutes and then strain as above. 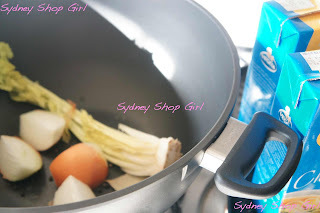 I left the stock to cool a little and it was then pretty easy to skim any fat off the top. To make the soup, sauté onions and some garlic in vegetable oil. Then add finely diced celery and carrot. Add the chicken meat and your herbs of choice (marjoram, thyme, dill, parsley) and simmer for half an hour or so. Then add peas and corn and simmer for a few minutes until they're cooked. Serve large bowlfuls with some toast before relaxing to enjoy the rest of a long weekend evening at your leisure. 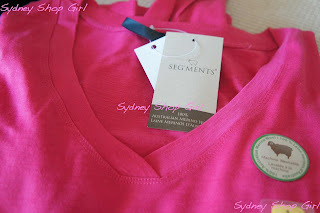 That pink Costco woollen top looks very promising! Umm I wonder when I'll be off to my first Costco trip? The one and only time I've visited Costco was in LA sixteen years ago and I thought I'd died and gone to heaven. The choice was unbelievable and from memory we had to sit on our luggage to zip it up. I wonder when/if Brisbane will ever see this store? Hope so. Why do men not have the 'I love it so I'd better buy six' gene? So often when I visit your blog, I get a huge urge to sign up to Costco and go nuts with the credit card! I hope you dont think I'm going Single White Female on you but that merino wool sweater is too divine to ignore. I am totally going to Costco this week to get one. Ps love the frankfurt/super hero metaphor. Lol.